Cowboys Beat Sooners!Raushaun Woods and Josh Fields did it to Oklahoma again. One year after ruining the Sooners' postseason plans with a late touchdown in Norman, Fields and Woods connected for three TDs as Oklahoma State upset No. 3 Oklahoma 38-28 in front of a national television audience. 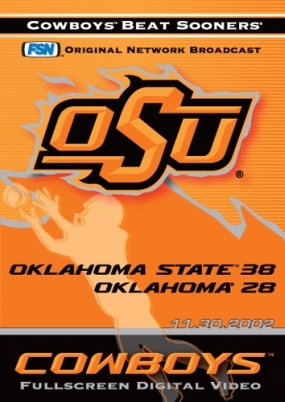 This DVD contains the complete 2002 Oklahoma State vs. Oklahoma Rivalry game as seen on Fox Sports Network, without commercial interruption, in fullscreen digital video.